The emergence of millimeter-wave technology exploiting unused frequency band starting from 30 GHz opens new vistas for a plurality of applications in fields like aerospace, healthcare, automotive, the industrial sector and telecommunications. 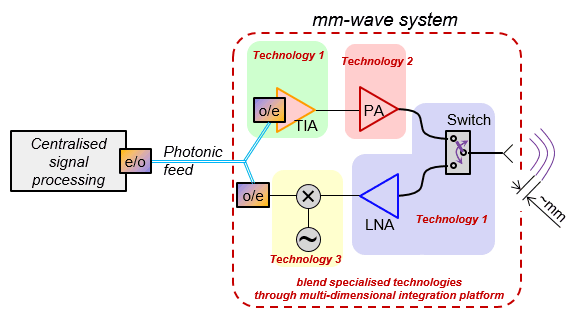 However, current semiconductor processes that form the foundation of mm-wave systems are yet not mature enough to fulfill the requirements of this uprising technology and thus pathways towards exploitation of this future-proof market remain untapped. TRITON will provide solutions for mm-wave technology along the entire functional chain: originating from high-frequency gallium-nitride-on-silicon-carbide (GaN-on-SiC) and silicon-germanium (SiGe) electronics capable to operate energy efficiently at frequencies like the 30-GHz Ka-band as considered for next-generation wireless access towards silicon-on-insulator (SOI) photonics featuring low-drive modulators and photodetection for seamless translation of signals to and from the optical domain. At the core of TRITON’s technological mm-wave compound lies a silicon interposer that serves as versatile integration bench for III-V and group-IV components. Several functional yet heterogeneous semiconductor elements of TRITON can be processed with different technologies and consecutively blended using industry-compatible assembly processes rather than being stalled from co-integration at the system level due to a technological lock-in. TRITON aims to fabricate and characterize test-chips according to its forward-looking methodology, incorporating the functionalities of mm-wave amplification in the 27-32 GHz range and translation to and from the optical domain in view of emerging applications in 5G and the industrial internet.